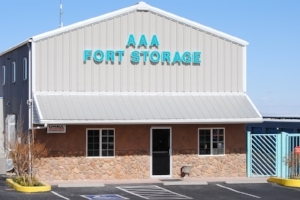 AAA Fort Storage has much more than storage. Great security, wide aisles, climate control, RV dump stations. We are here to serve. Some of our amenities are obvious; others are behind the scenes. Either way, we are working hard for you. We have newly upgraded over 50 cameras - they're running 24 hours a day 7 days a week. None are dummies, so SMILE! Your storage unit is available to you from 6AM to 9PM (0600 to 2100) 7-days a week. Limited access reduces crime potential. On-site live-in management and numerous employees provides constant supervision, increased security and quality service. DVR gate and office monitoring and customer screening help round out our facility's security and service. We have all-night security lighting. Storage units are of steel panels and all have a layer of insulation which helps dissipate both heat and moisture. A 7-foot solid steel fence topped with razor wire surrounds the whole facility. Large, wide spring-wound roll up storage doors make access much easier on your back. We loan you a highly rated LAI lock, so there's no need to buy your own. We perform security checks all throughout the day making sure the facility and units are secure. Extra-wide 35 foot aisles provide easy access and navigation for large moving vans, trucks and tractor-trailers. Our narrowest aisle is 30 feet wide. There is ample room for even the largest moving truck or van. We have an array of packing supplies in the office. We can even charge purchases to your account. U-Haul Rentals. We are an authorized U-Haul dealer. You can make reservations, pick up and drop off equipment right here. Fork lift services. Have something that is not humanly possible to lift, even with help? Are you a business storing your goods and have semi-truck deliveries? Talk to us about our forklift. Standard Storage: All our storage units are of steel construction with an easy-roll up door and insulation to help dissipate heat and moisture. Standard Sizes include: 5x10 (50sf), 10x10 (100sf), 10x15 (150sf), 10x20 (200sf), 15x20 (300sf). Ceiling height is about 8ft; door height is 7ft. All unit sizes are close approximations. Climate Control: Our units have 3" of insulation in the ceiling and exterior walls. Perfect for storing all your temperature-sensitive goods: furniture, documents, records, pictures, clothing, electronics, film....The Climate-Controlled building has its own access code, providing TRIPLE security for documents, records and other items needing further protection. All unit sizes are close approximations. Warehouse Units: This refers to storage space exceeding our standard unit sizes. 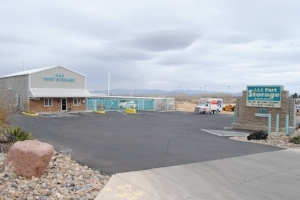 Local businesses, vendors and contractors working on Fort Huachuca appreciate the space for storage and the easy access for delivery trucks of all sizes. Electric Units: We offer lighting and 110 outlets in some of our units . We have 200 and 300+ square foot spaces available. All unit sizes are close approximations. Gun Lockers: We have weapons storage lockers. Click to find out more information. Covered Parking for RVs, Class A, B, C, 5th-Wheels Autos, Boats, Trailers, Campers. Includes trickle charge for batteries, dump station, security lighting and security cameras. Price is $120 per month. Open RV parking is $66/ mo.